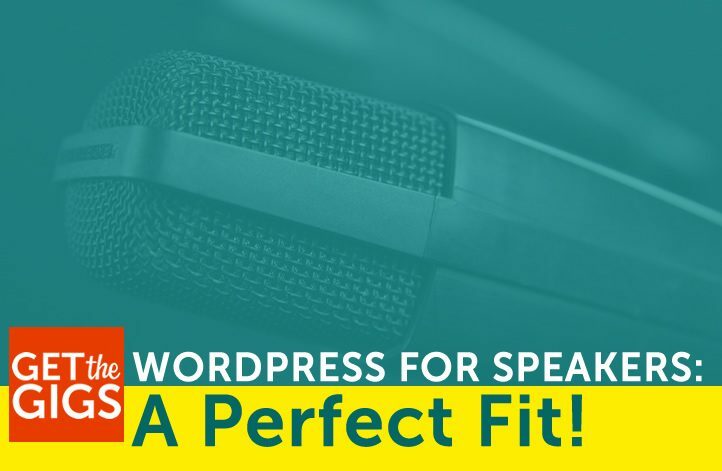 WordPress For Speakers: A Perfect Fit! I am a fierce and loyal WordPress advocate. It’s all I use for websites and I’ve logged time on over 300 sites. I love it so much that I not only use it for my business site, I have devoted a lot of time to the WordPress community. There’s a reason this CMS and web design juggernaut powers over 30% of the web: It’s awesome. For speakers? It’s a perfect fit. Maybe you’re planning a website design project soon. Maybe you’ve thought about switching your current site to the platform. It’s the right call, but allow me to settle the debate for you. When it comes to basic tasks like blogging and updating text, the entry level barrier is low. WordPress was designed explicitly for blogging. As such, the interface for adding and formatting text is very simple. For most people, a quick tutorial gets them up and running. There’s no need to rely on a webmaster for every little text update. You can get in there and do it yourself. The best part: the core software is absolutely FREE to do with however you wish. Imagine an army of millions as your support crew. WordPress is a software by the people for the people. Millions of users contribute to updating the code, creating plugins, and fielding technical questions. This means that innovation never stops. It is a living organism that keeps growing and getting better and better. One of my favorite parts of the open source aspect is the WordPress codex. The codex is a massive forum where people from the community hang out answering technical questions. If you’ve got a problem, chances are someone else has already run into it and is ready to help. One word – plugins. Plugins are the magical expansion packs that make it possible for designers, developers and even DIY users to do just about anything. Need to collect email addresses and send out newsletters? There are plugins for that. Need to embed your podcasts? There are plugins for that. Need to integrate seamlessly with social media? You guessed it. There are literally millions of plugins available. Some plugins are free, some are paid (premium). If you can you dream it, chances are there’s a plugin to do the job. WordPress has been going strong for over ten years. A lot of web platforms have come and gone in that span. Few things are more discouraging than learning to use new software to develop a site, only to have the tools die on the vine. You’re left with a site that’s no longer supported and a software no longer receiving any updates. Luckily, the software and the community show no signs of slowing down. If you were to plot growth on a chart, it would be an arrow pointing up. Over a quarter of the web is built with it. That is a HUGE number. If you want the best bet for a web platform that is going to be around tomorrow, bar none it’s WordPress. WordPress takes care of 80-90% of the mechanics of Search Engine Optimization (SEO). That’s high praise from the company that holds the keys to the web. Even if all you did was set up WordPress with your content, it would already do a great job with SEO. Need to a more recent rave for WordPress and SEO? Check out this read from Torque. I’ll save sharing all the nuts and bolts of why WordPress is such a smart choice when it comes to SEO. Instead, I’ll leave it at this: there isn’t a web platform out there that does SEO better. Plus, you have the fantastic (and free) SEO plugin, Yoast at your disposal to take it to the next level. What do you think about WordPress? Obviously, I’m a fanatic. I can’t help it, it’s a great platform developed and managed by an amazing community. And for speaker sites? It’s a great fit all around. Maybe you’re on the fence about the best solution for your website needs. If so, I’d love to have a conversation with you. Call me or shoot me an email. Maybe I can make you a WordPress enthusiast. https://www.getthegigs.com/wp-content/uploads/2016/04/NEW-perfectfit.jpg 471 722 Derek Hart https://www.getthegigs.com/wp-content/uploads/2018/06/GTG-w.png Derek Hart2018-06-19 13:29:532018-07-13 19:49:01WordPress For Speakers: A Perfect Fit!